Japanese Episode AG 099: "Fuu to Ran! Uchuu Sentaa no Tatakai!" 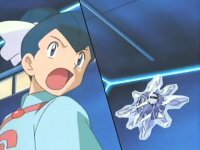 American Episode 371: "It's Still Rocket Roll to Me"
Now that Satoshi and the gang have arrived in Tokusane City, the young trainer from Masara Town is eager to find the Gym Leader. When he finds the Tokusane Gym, he finds out that the Gym Leader is at the Space Center instead! Once the young trainers arrive at the Space Center, they have fun trying out the various space equipment. Meanwhile, the Rocket-Dan spot the Space Center's rocket and hatch a plan to hijack it to give to their boss. Back in the center, Satoshi-tachi finally stumble across the Gym Leaders; Fuu and Ran, a pair of twin siblings who use a Lunatone and Solrock as their signature pokemon. Satoshi is told that the Gym Battle will be a double battle, but that he'll have to wait until after the rocket launches before the match can be held. As the gang waits for the rocket, Masato and Fuu sneak into the rocket's cockpit. Before long, the Rocket-Dan show up and steal the rocket with Masato and Fuu in it! A group of Yajiron stop the rocket in mid-air while the two stowaways thwart the Rocket-Dan's plan. Once the trio is dealt with, Masato and Fuu are told how to return the rocket back to earth. Now that the rocket is back, safe and sound, Fuu and Ran are ready to battle Satoshi for his seventh Houen League badge. Can Satoshi win this unusual Gym Battle? To be continued! Well, we go right from one storyline to another. If you ignore the fact that the characters are suddenly in Tokusane City, acting as if the events in the previous episode didn't happen, then you've got an enjoyable episode. Seeing our heroes in a Space Center gave us some humorous moments, and it's hard to believe that the anime characters haven't tried to put our heroes in space before. While the portrayal of the rocket launch had all kinds of problems, it was still a fun episode. The dubbed version has about one major change, but other than that it's pretty much unedited. 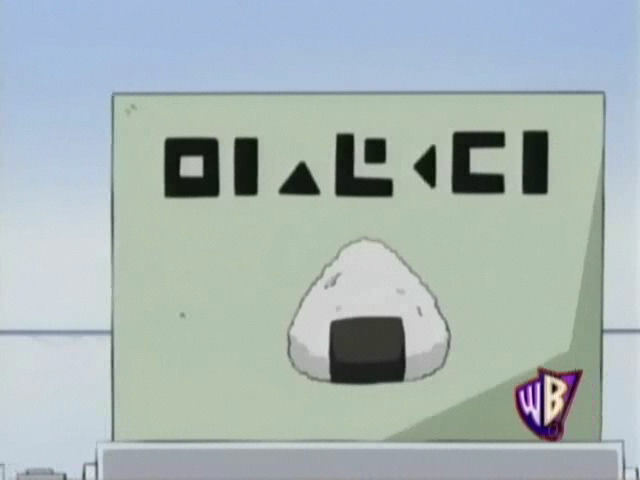 What's odd to me is that 4Kids left the onigiri label on the food crate alone when they went to the trouble of painting it over in "Judgment Day." Was that episode's edit just a one-time thing or what? Glory Day (ver. 1) replaces Smile as the ending theme as of this episode. It's pretty much my favorite ending theme in all the anime, and we'll see it until the start of the Battle Frontier saga. Whoo. A second is trimmed from the opening shot of the episode. Two seconds are trimmed from the episode's title screen. Later, after the main commercial break, there's a second cut from the shot of the Space Center. Which, by the way, looks like a giant Polock case to me. Jessie: "Liquid lunch meat! I've heard of this stuff!" 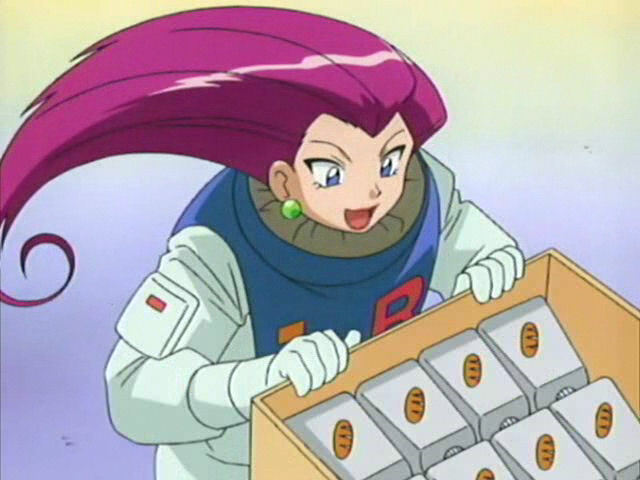 Originally, Musashi just identified the stuff as space food (uchuu shoku). In fact, if you look at the labels, you'll see that it looks more like bread than any lunch meat. Jim: "Just do exactly as I tell you, understood?" After this part, in the Japanese version, there isn't a single line of dialogue until the shuttle actually lands. Even though we see Jin's mouth move in several shots, all we hear is a piece of dramatic music playing. It's a nice change of pace from the way the anime producers usually do things, and I think the whole "not showing anyone talk" gives the impression that the shuttle landing took longer than what they showed us in this episode. What can I say? I'm a sucker for odd directorial decisions like this. In the dub, however, they decided to make up dialogue to go with the scene, meaning that the dub is a lot more talkative than the Japanese version is. In fact, 4Kids makes up a LOT of dialogue for these scenes, and it gets really annoying after a while. Bah. Three seconds are trimmed from the scene right after Kids' WB! 's final commercial break.